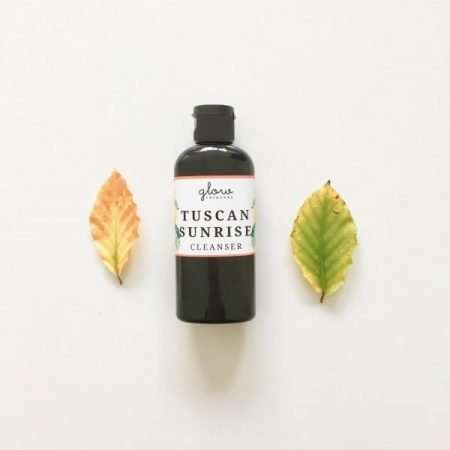 Tuscan Sunrise – mood enhancing cleanser that respects your skin’s biome. This waterless orange hued and scented cleanser is full of skin loving fruit and berry extracts that are packed with antioxidants and omega threes. Sweet orange, mandarin and patchouli essences, anti-oxidant herb of immortality, hydrating glycerine and apricot kernel nurture your skin while cleansing it tenderly. How to use – apply Tuscan Sunrise to your palm. Add a splash of water and mix in your palm, then smoothe onto your face. Massage with small circles to move the lymph and Qi and release tension. Inhale deeply, allowing the essential oils to envelop your senses, caress your mind and convey optimism and positivity. Then rinse off with tepid water. Finish with a spritz of collagen boosting Drench, and seal in with Empress Elixir. Tuscan Sunrise is designed to respect your skin’s biome and add a touch of joy to your day. The Ancient Chinese energy masters knew that orange essence instilled a sense of joy and playfulness and dispelled gloomy mindset. Experience the joy of Tuscany everyday. Click to order yours today! Tuscan Sunrise - mood enhancing cleanser that respects your skin's biome. This waterless orange hued and scented cleanser is full of skin loving fruit and berry extracts that are packed with antioxidants and omega threes. Sweet orange essence, anti-oxidant herbs, hydrating glycerine and omega rich sea buckthorn and apricot kernel to nurture your skin while cleansing it tenderly. How to use - apply Tuscan Sunrise to your palm. Add a splash of water and mix in your palm, then smoothe onto your face. Massage with small circles to move the lymph and Qi and release tension. Inhale deeply, allowing the sweet orange, mandarin and patchouli essences to envelop your senses, caress your mind and convey optimism and positivity. Then rinse off with tepid water. Finish with a spritz of collagen boosting Drench, and seal in with Empress Elixir. Tuscan Sunrise is designed to respect your skin's biome and add a touch of joy to your day. The Ancient Chinese energy masters knew that orange and manadarin essence instilled a sense of joy and playfulness and dispelled gloomy mindset. Patchouli has been used to lift anxiety and depression for centuries. This special blend of essential oils will uplift and inspire you through these cold and dark days of Winter.